When it is winter and all you see is snow everywhere, it is easy to hope, wish and pray for summer to arrive as quickly as possible! When the summer heat starts to boil over, it is then easy to hope, wish and pray for fall to arrive! Since it is impossible to change the seasons on a wish’s whim, we have to deal with the heat while it is here. 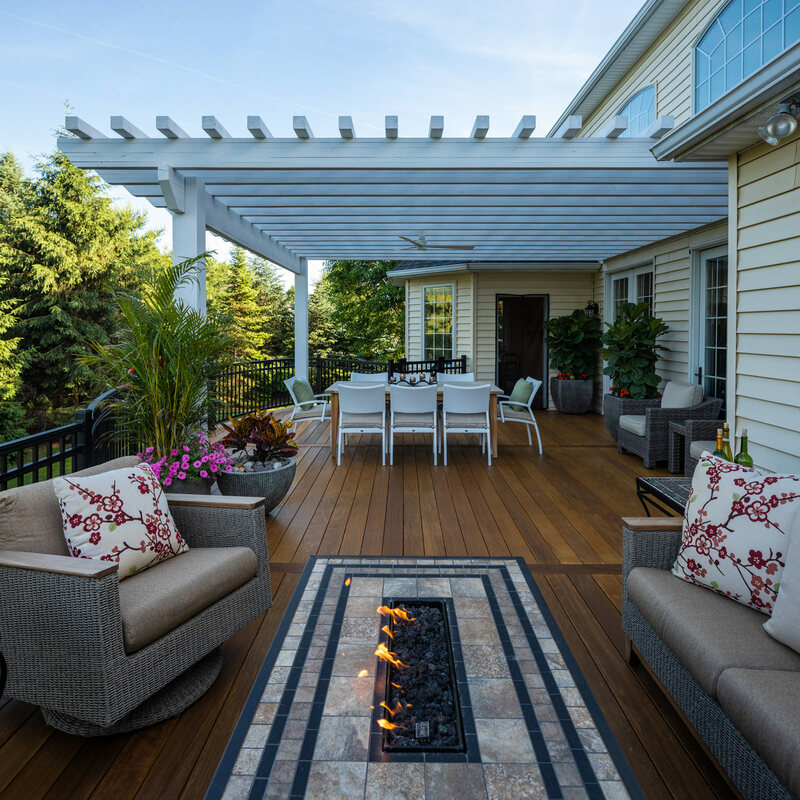 There are, however, a few outdoor elements you can incorporate into your backyard living space to live with the heat in harmony. A gazebo is a great way to enjoy being in the middle of the outdoors while being comfortable in the shade at the same time. 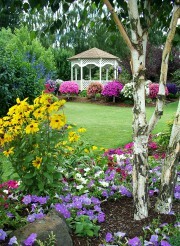 A gazebo is typically an open-air, eight-sided structure with a domed roof. As an added comfort element, gazebos can be screened to keep the mosquitoes and flies at bay. Because the structure is an octagon shape, it is perfect for relaxing, dining and entertaining because you are seated facing your company at all angles, promoting togetherness and good times in the shade. Pergolas are a wonderful addition to your outdoor living space. Pergolas are also open-air structures allowing the summer breezes to sweep through, but the roof is slated rather than fully closed like gazebos. The slated roof still allows peaks of sunlight to filter through giving you the perfect balance of light yet muted warmth. Plants such as wisteria, clematis, honey suckle and trumpet vine can be trained to grow up the pergola, creating a naturally beautiful shade element to the structure. If you would like to be closer to home, don’t underestimate the power of your back porch. Home porches are also shaded, allowing you to take a break from the extreme sunshine that blazes at this time of the year. 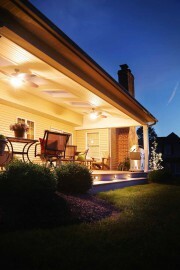 When hanging out on your porch, you are only a few steps away from the fresh-brewed iced tea in the refrigerator. For an added temperature relief, you can have a professional install outdoor-rated ceiling fans to circulate the air, also shooing away those pesky insects! Incorporating colorful hanging baskets of flowers, comfortable furniture and some decorative pieces can easily morph an underused and under-imagined porch in to a cool summer relaxation station! Consulting a landscape designer would be a great benefit when you want to beat the summer heat by utilizing plants, trees, shrubs and grasses. Thick and healthy grass in your backyard can feel like heaven on your feet when the temperatures are soaring. You won’t look like you are running across hot lava when you are walking from one side of the yard to the other. By planting shade trees to relax under, you can cut the temperature by 6-8° alone! 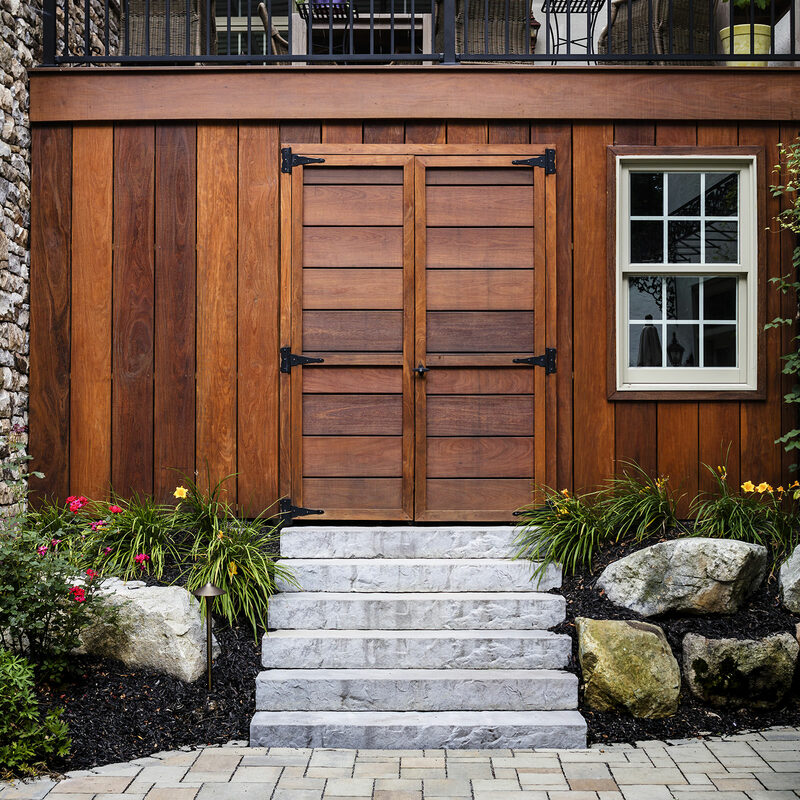 Your landscape designer can use their expertise to make a custom plan for your home, which can cut the temperatures inside your home in the summer, aid in natural heating in the winter, and also save you money on your utility bills! 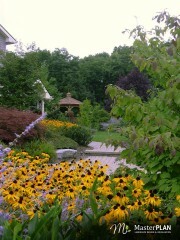 Don’t forget a custom landscaped backyard is also a visual and physical stress reliever! Landscaping appeals to all the senses, in such a serene way that is hard to match. A swimming pool is the number one way to beat the late summer heat. Incorporating an in-ground pool into your backyard living space requires a well thought out design and installation by professionals. 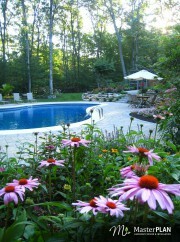 Swimming pools are inviting and a visually appealing steadfast aspect to your home. Your outdoor master plan will benefit the most from a gentle mix of hardscape and softscape around this water feature. The pros will know exactly which plants work best around a pool to keep the leaf litter at a minimum. If you don’t want to fully commit to a swimming pool just yet or simply don’t have the room, a live running water feature can be a great alternative. 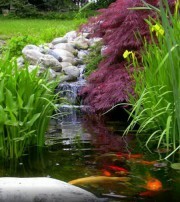 The look and sound of a water feature in your backyard distinctly elicits calm and relaxation. Water features also seem to make the summer heat more manageable! Whether you opt for a pond filled with beautiful swimming fish or a pondless water feature that can act as a summer respite for the kids to safely splash around, these water features provide a welcomed distraction from the heat and humidity. 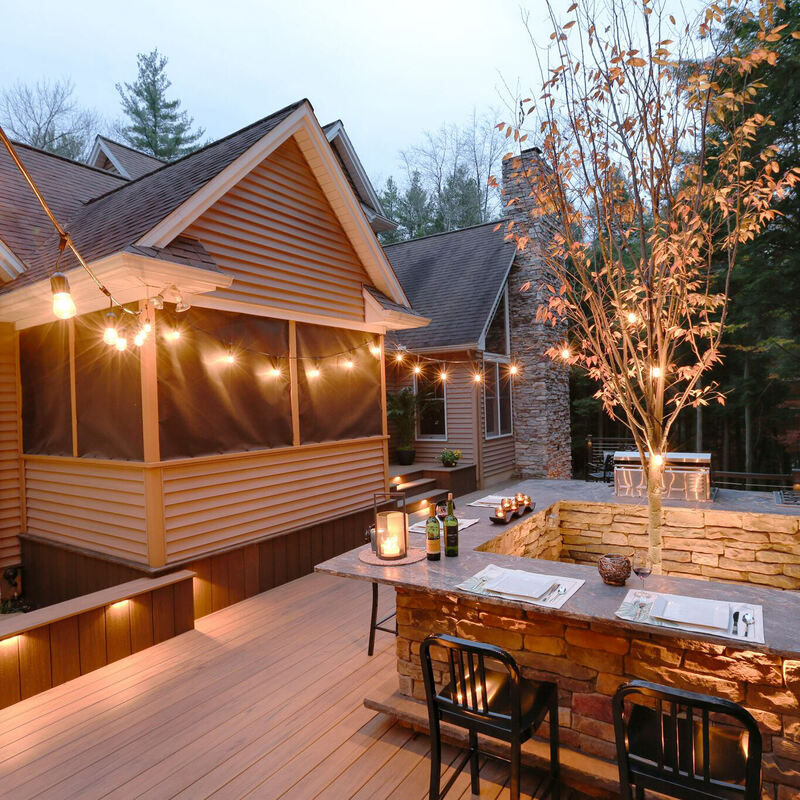 When you are ready to take a few or several of these recommendations and turn them into your own custom outdoor living space reality, reach out to MasterPLAN Landscape Design to guide and be alongside you throughout the process. We are enthusiastic about developing your needs into a master plan that can be built al at once or in phases. We think long-term to ensure your successes come to fruition! 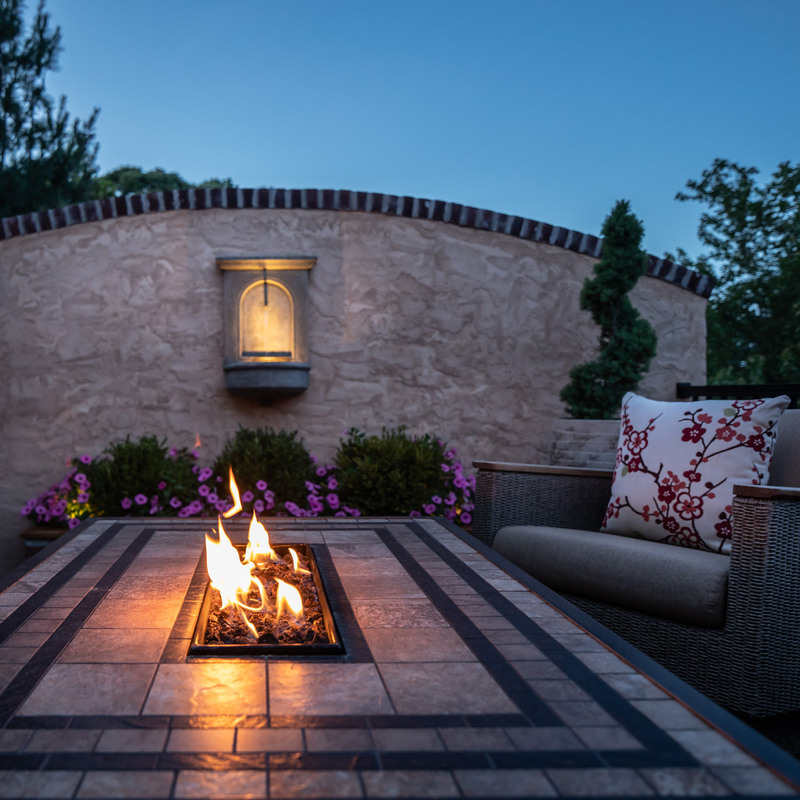 We understand that a backyard is so much more than a pool, deck or patio; it is a place where life-long memories are created and special moments are shared with loved ones.